But, there are some wonderful ideas to be found on Pinterest. Tonight, I made two of the recipes that I had pinned to my boards: Spaghetti with Artichoke Hearts and Tomatoes from the Pioneer Woman, and Caramel Shortbread from Two Tarts. Both blogs are wonderful, so I was excited to try these treats. 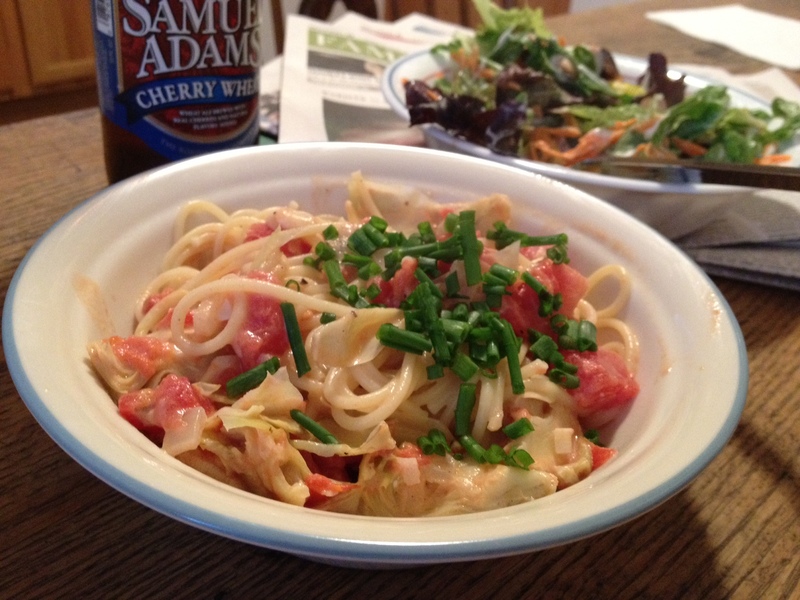 Mmm creamy tomatoes and artichokes mixed with pasta and herbs. One of my favorite side dishes that my aunt makes at Christmas is simply canned tomatoes and artichokes. They are mixed up with a little sugar and baked until warm. For some reason, I can never make it as good as it is at Christmas dinner. I was excited to find this pasta recipe, because it blends that simple side dish with cream and pasta, so it all cooks together and is rich and fresh and delicious. Leftovers will be so good! It was time for another baking project tonight, since you know, it’s been two days since I’ve baked anything. That’s like a lifetime. So recently on Pinterest, this caramel shortbread caught my eye. During lunch, I walked to the kitchen store to pick up a candy/deep fry thermometer. You never know when that may come in handy, anyways. It’s probably good to have around. Perhaps I’ll have to make doughnuts or something else deep fried soon I’m sure I’ll find uses for it. Anyways. The shortbread was simple enough to put together – basically just melted butter, sugar, flour, an egg yolk. The caramel was also fairly simple. I’ve never made caramel before, but if you follow the directions, it works out just fine. This one uses honey instead of high fructose corn syrup. Other ingredients are sugar, vanilla, butter and cream. Nothing bad in there. 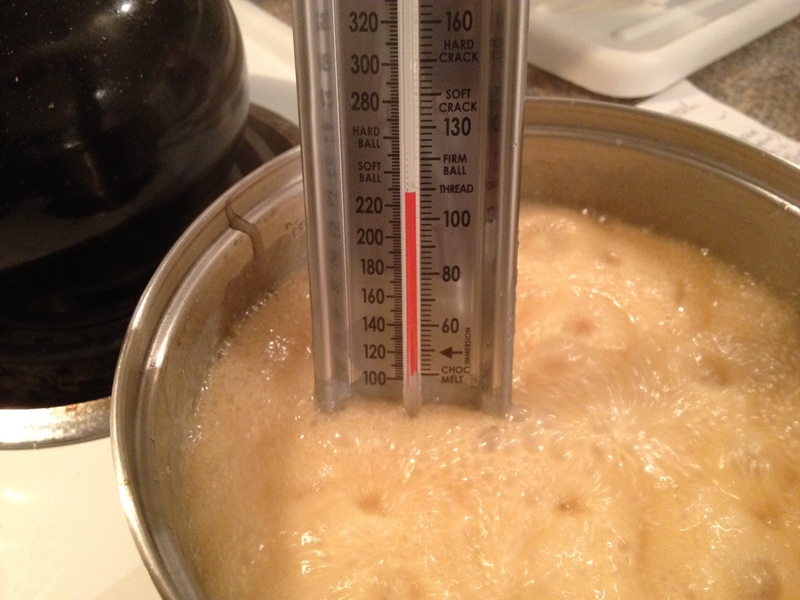 The key is waiting for the candy to get to the right temperature - 240 degrees. It's not quite done here. 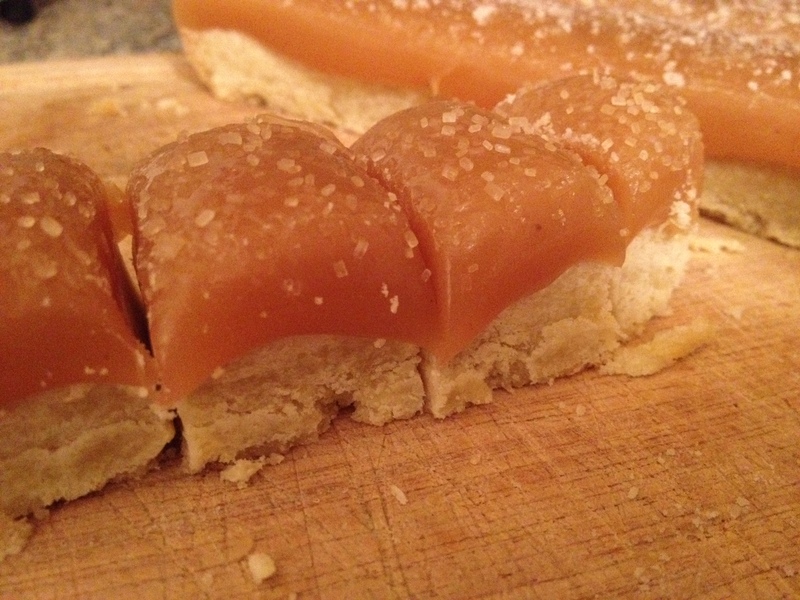 But after you pour the caramel on top of the cooled shortbread, you have to let it sit. Now I don’t mind waiting between steps of a recipe, like for yeast bread to rise. But when it’s all done and seemingly ready to eat, but that’s when you have to wait, that’s the hard part. And my housemate, who was looking forward to being a taste tester, already went to bed. So she’ll have to wait even longer now, until tomorrow! I stuck them in the freezer for a bit because it was getting late and there was no way I was waiting til tomorrow. But then when I started cutting the 8×8 square into bite size pieces, the caramel quickly started to warm up. You can tell because it’s not cut in crisp, smooth lines like on the original blog. These started to warm up quickly while I was cutting them into bite-size squares. But, they are delicious. Crisp, buttery shortbread, topped with gooey, buttery caramel. Mm. I sprinkled sugar in the raw on 1/3 of the pan before cooling, and ground some of my favorite Trader Joe’s pink sea salt on another 1/3. I think I like that flavor combo best, because the tiny bit of salt brings out the sweetness, but also cuts down on it a little bit — if it’s possible to have both effects? I didn’t finish cutting the squares and stuck them back in the fridge. Once they completely set up, I’ll try again tomorrow. Hope the newsroom enjoys them! Next ›23 days til our roadtrip up the Pacific Coast Highway! This looks AMAZING Katie!! YUMMMM! !